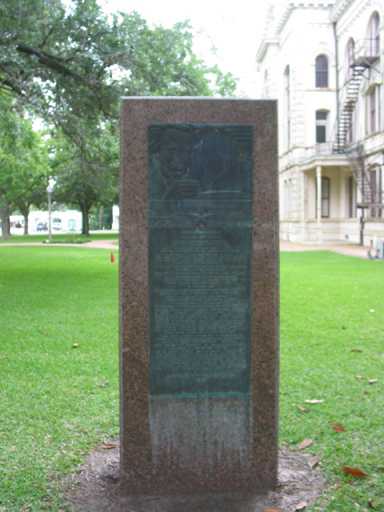 Site of projected capitol of Stephen F. Austin's colony, 1823. First settlement at this point shown on Stephen F. Austin's map of 1835 as Montezuma. 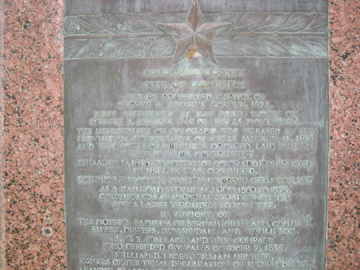 The municipality of Colorado was created by the provisional government of Texas January 11, 1836 and the town of Columbus ordered laid out as the seat of government. On March 17, 1836 the county of Colorado was created; in 1837, it was organized. Columbus, the county seat, was incorporated June 5, 1837. As railroad terminal, from 1869 to 1873, Columbus was an important trading center for a large territory to the west. In memory of: The pioneer families of Burnam, Gilleland, Cummins, Fisher DeWees, Kuykendall and Tumlinson. J. W. E. Wallace and his company who defended Gonzales October 2, 1835. William D. Lacey, Will Menefee signers of the Texas Declaration of Independence. Leander Beason, John P. Borden, David Cole, Stephen T. Foley, George W. Gardner, S. Joseph Garwood, Basil G. Ijams, Dr. James D. Jennings, Alfred Kelso, Amos D. Kenyon, Daniel Miller, James Nelson, Mitchell Putnam, Dempsey Pace, William Pace, Washington H. Secrest, Maxwell Steel, Robert Stevenson, Spencer B. Townsend, William Waters, Leroy Wilkinson; San Jacinto veterans who lived in this county prior to or after the Texas Revolution. Col. John C. Upton, Major John S. Shropshire, Major J. S. West, Capt. P. J. Oakes, Capt. James D. Roberdeau, Capt. R. V. Cook; Confederate officers. The following citizens of distinction have resided in Colorado County: Jones Rivers, jurist; Dr. Lawrence Washington, Gail Borden, Matthew Stanley Quay, Senator for Pennsylvania; Chas. 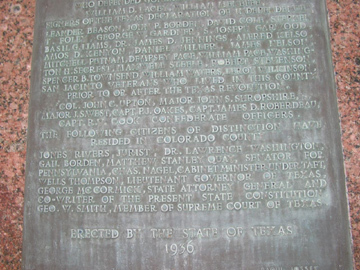 Nagel, cabinet minister under Taft; Wells Thompson, Lieutenant Governor of Texas; George McCormick, State Attorney General and co-writer of the present State Constitution; Geo. W. Smith, member of Supreme Court of Texas.